Kudos to Kalamazoo Township for installing 67(!) 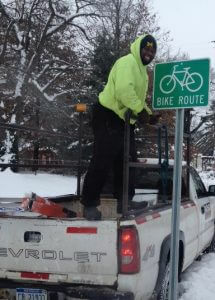 new Bike Route signs, including the one featured here, at locations in the Eastwood and Westwood neighborhoods. Signs along the “Westwood Wiggle” direct bicyclists from th e West Main Hill neighborhood through Westwood, north of M-43, toward Drake Road, where another leg connects with the Kalamazoo River Valley Trail near Ravine Road. When signs are placed along bike routes in the City of Kalamazoo, bicyclists will have clearly marked paths to travel along many quiet streets between downtown and the surrounding countryside. Well done!